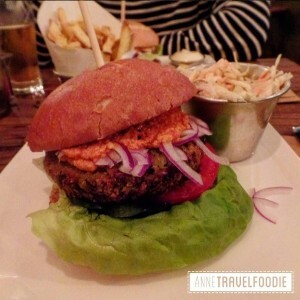 Amsterdam has many places where you can get a good burger. 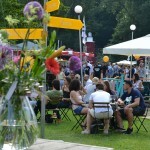 Several lists can already be found with the best burgers of Amsterdam. 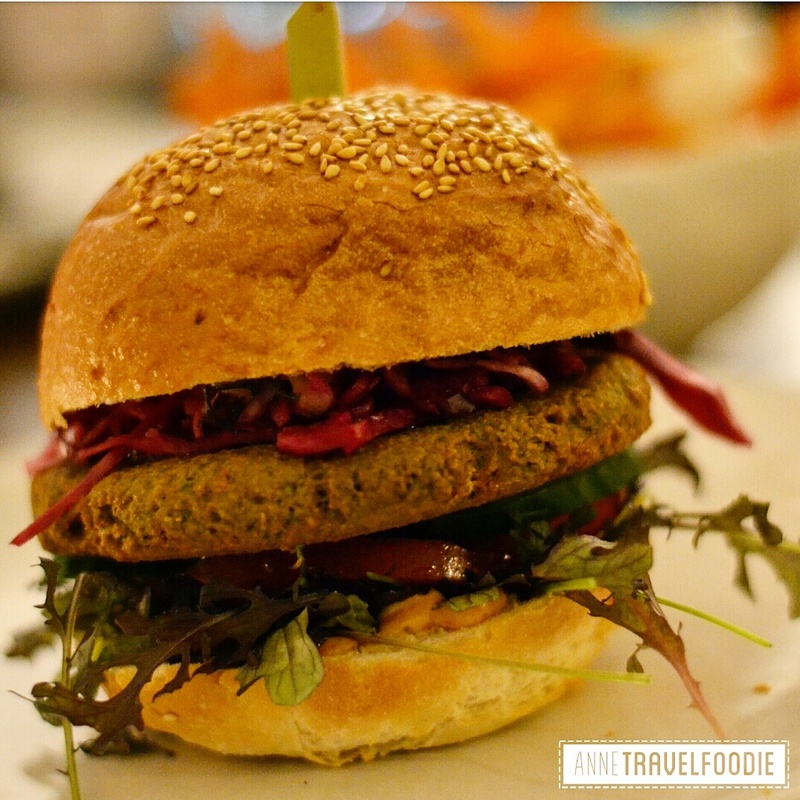 But there wasn’t a list yet for the best veggie burgers of Amsterdam. I love the concept of a burger, a nice bun, sauce, lettuce, tomatoes and a tasty patty. But as a vegetarian, I don’t want to eat hamburgers, but veggie burgers! 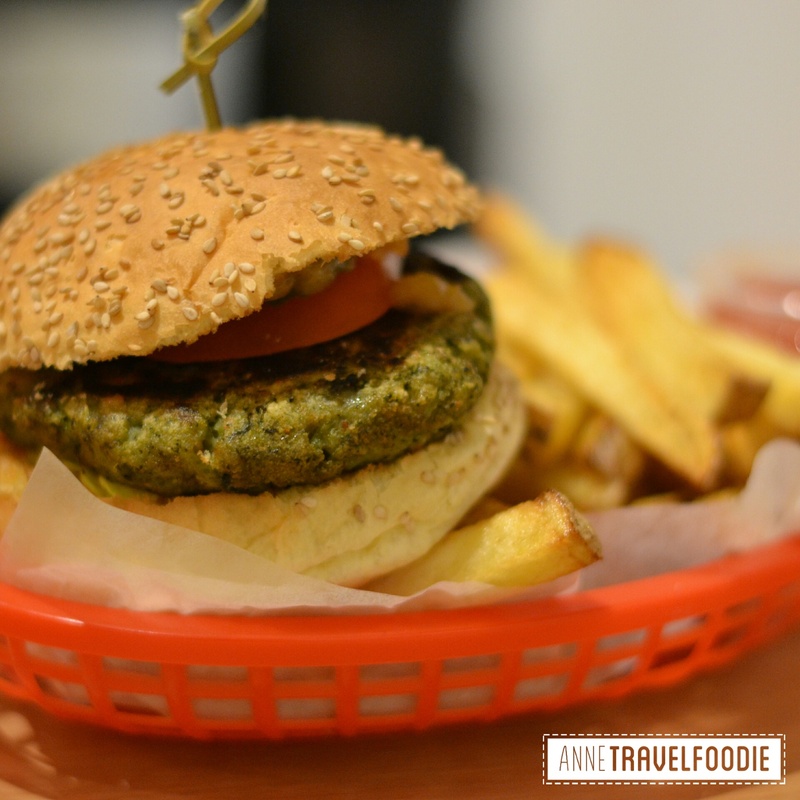 So I went on a quest to find the best veggie burgers in Amsterdam. 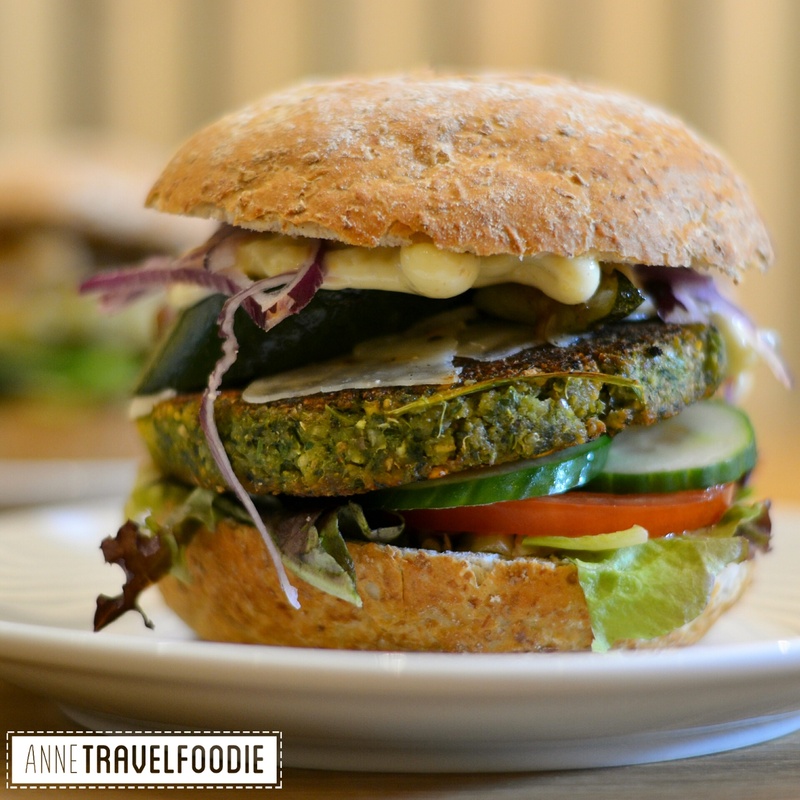 I’ve tried many vegetarian burgers all over town to come up with a top 10 of my favorite veggie burgers. On this page I’ve shared the winners one by one, starting with the number 10 and moving up to my most favorite veggie burger in Amsterdam. All of the burgers on this list are vegetarian, if it’s suitable for vegans I’ve mentioned it in the description. The number 10 position is for the ‘happy cow burger’ from Feel Food, a veggie burger made from chickpeas, lentils, beans and walnuts. 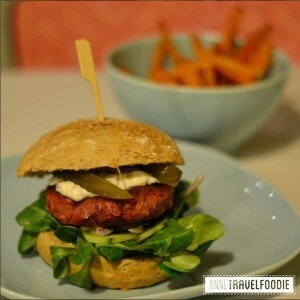 It’s served with homemade sauce on the side, which you can easily swap for a vegenaise to make this a 100% animal-free burger suitable for vegans. The burger is very colorful but alas a bit dry. Feel Food is a great hidden gem by the way. Although the locals have found it for their healthy deliveries, not many know that you can also eat-in at this restaurant with many vegetarian options. Number 9 goes to the veggie burger from Thrill Grill. Michelen star chef Robert Kranenborg spent a year on tests and experiments to create a really good burger for his burger restaurant Thril Grill. 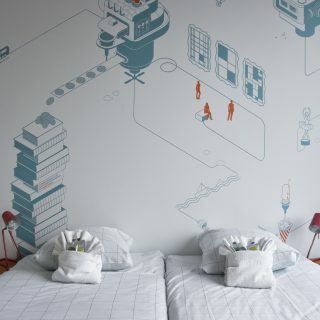 After opening their first restaurant in Haarlem they have two shops in Amsterdam as well. 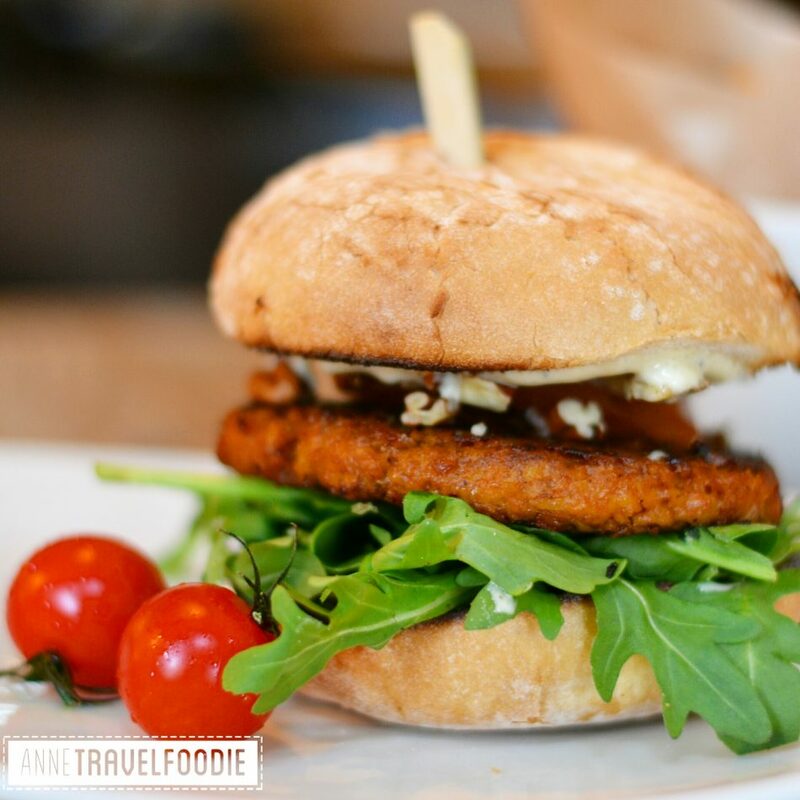 Their veggie burger is called Falafel Thriller and has a falafel patty, red bell pepper hummus and is served on a toasted organic bun. 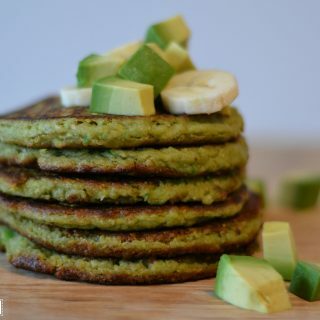 The falafel patty is very tasty because of the spices and herbs that are used. But it was also a bit dry and therefore fell apart while I was eating it. 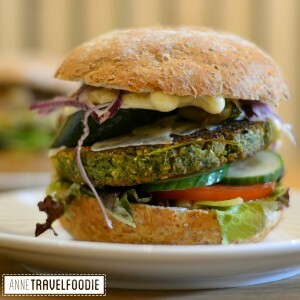 On the 8th place I’ve chosen the veggie burger from Burgerlijk. Burgerlijk first opened up in the really nice area of the Nine Streets and opened a second shop in Amsterdam Old-West. Their veggie burger is a bit spicy, they flavor it with Indian herbs. 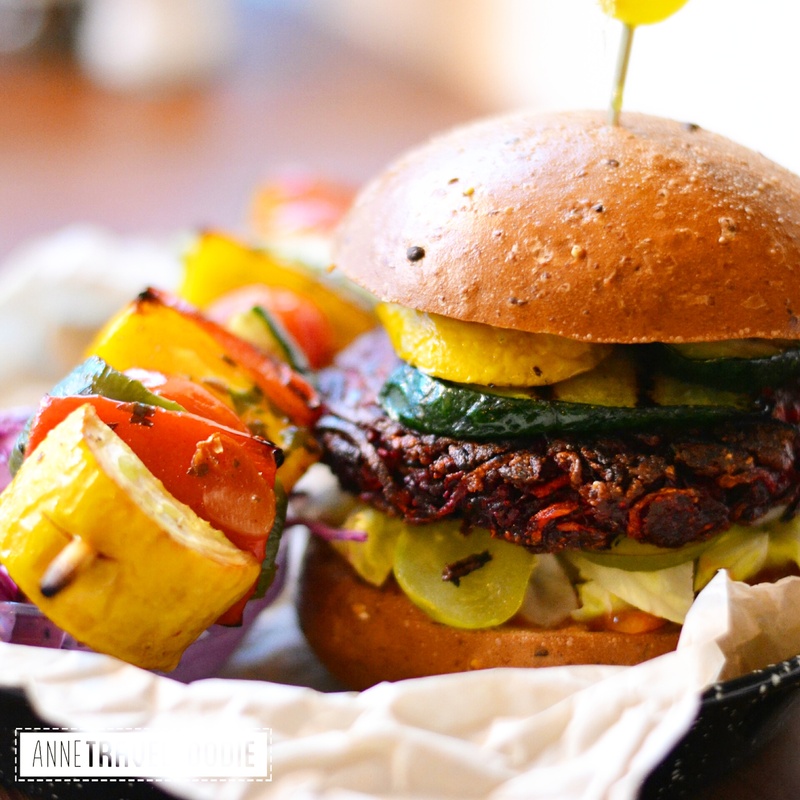 The patty is not only tasty, it’s also a great texture and not as dry as some veggie burgers. The burger is vegan unless you top it with one of their cheeses. 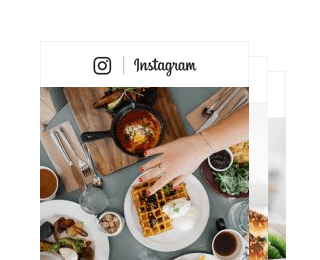 The can improve on the presentation, since looks are very important for foodies on Instagram. 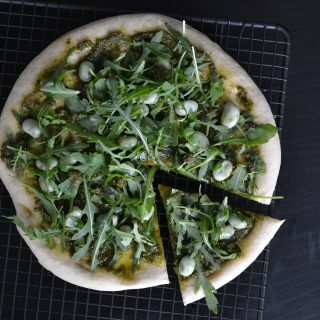 And the toppings are a bit standard. Nevertheless, this is a tasty veggie burger! Artisani is a hamburger restaurant at the Kinkerstraat in Amsterdam Old-West. They serve halal burgers and homemade lemonades. They also have a veggie burger topped with halloumi cheese. Because of the big amount of cheese, you don’t have the dryness that some veggie burgers have, but you do have to like cheese a lot. They serve their burger on a brioche bun, which is great if you like sweet and soft inside/crispy outside. I prefer a less sweet bun however. Geflipt doesn’t have many options on the menu, so it’s great for people who get stressed from too many choices. They have 1 beef, 1 spicy, 1 lamb, 1 chicken and 1 veggie burger. 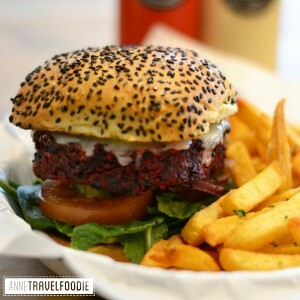 The ‘Las Vega’ is a veggie burger made from red beets, feta and black beans with provolone cheese. It was nice and soft, not too dry. The burger has many layers and ingredients, that makes it very tasty because the patty itself not very rich in taste. 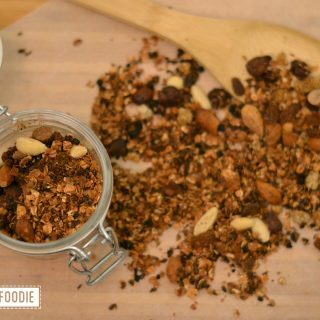 Geflipt works with fresh and local products as much as possible. While I was on my quest to find the best veggie burger in Amsterdam. Several people recommended the Dophert burger to me. I had been at Dophert for lunch before but I didn’t have the burger yet so I was very curious! The vegan burger is made from chickpeas, giving it a falafel-like taste. It was really tasty, especially with their chipotle sauce and sweet potato fries. Soulburger (near the Overtoom) opened less than a year ago and are already one of my favorite burger places. Pictured is their Veggie Wonder Menu that contains a beetroot burger, a veggie skewer and cole slaw. Originally the burger is served with goat cheese, but you can skip it (like I did) for a 100% vegan burger. 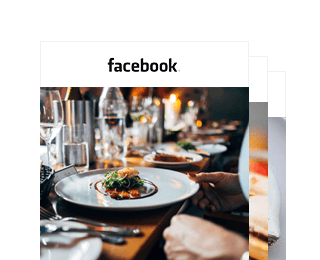 The international staff is very friendly and the atmosphere is great; it feels more like a cosy restaurant than a fast burger bar. The beet burger is juicy but felt apart a bit. But they make up for that by serving the burger on brown bread! Ellis Gourmet Burger opened their first restaurant in Belgium and now has several restaurants in both Belgium and the Netherlands. Besides Amsterdam they also have a shop in Rotterdam and Breda. They have 2 vegetarian burgers on their menu; one with portobello and goat cheese and the Crazy Red Veggie. I went for the latter. It’s a red pepper and soy burger with baby spinach leaves, rocket, pecan nuts and lime mayonnaise. It’s served on a nice toasted bun. This burger also falls apart a bit but it has a great taste. 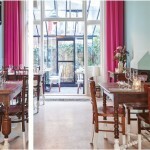 The restaurant is nicely decorated and on a wonderful location at the Prinsengracht in the canal belt. 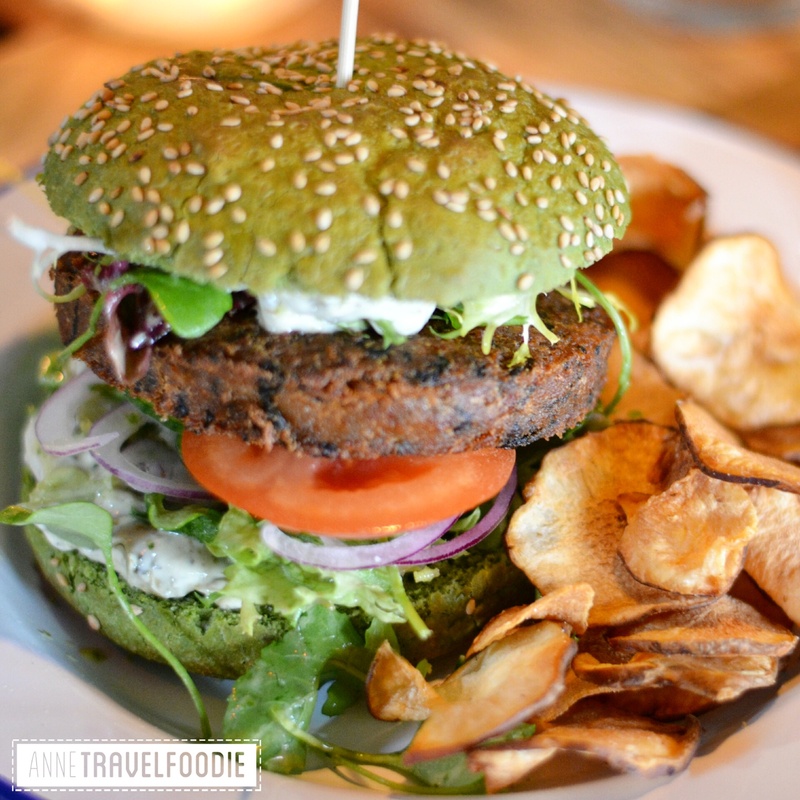 One of my most favorite places to get a veggie burger in Amsterdam is Burgermeester. They opened their first shop in 2004 and now have 4 restaurants in Amsterdam. Their menu changes regularly but the last time I was there they had 2 vegetarian burgers. One was a falafel burger with grilled vegetables and parmesan cheese and the other one was a manchego cheese burger with pear compote. You can choose if you want a white or brown bun. Their burgers are crispy from the outside and juicy from the inside. 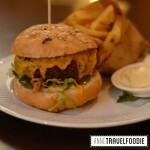 The falafel burger is nice and spicy and the manchego burger has a refreshing taste because of the pear and cucumber. Only downside? There are no vegan options. Other than that: great burgers! I absolutely recommend the Dutch Weed Burger to everyone, also meat lovers, just because it’s super delicious! I hope this list inspires you and I love to hear your thoughts. 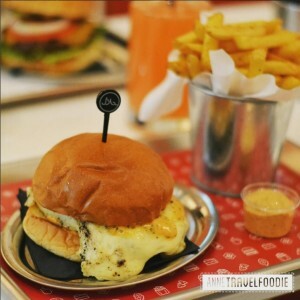 Have you tried one of the burgers on my list? Or do you think one is missing? Let me know!